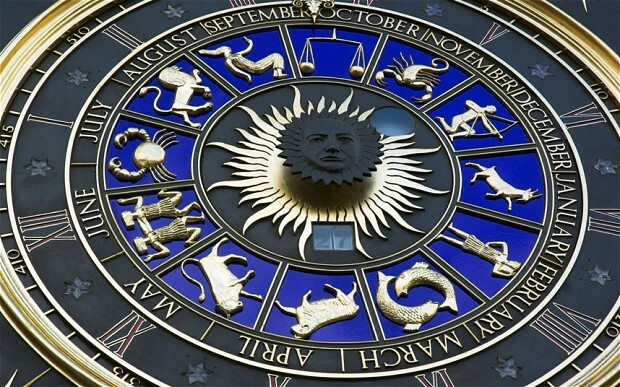 Most people believe that the astrological symbols we use are truly ancient. In fact they were a renaissance invention. This knowledge is rather important when you consider that John Dee’s Hieroglyphic Monad, and several Golden Dawn diagrams depend on these being the correct symbols. 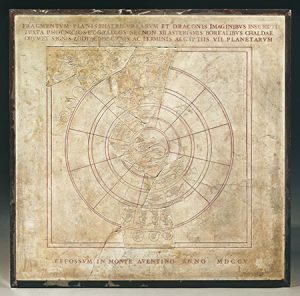 In early astrological drawings images of the gods were used to represent the planets they controlled. 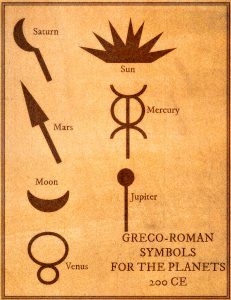 Each god had a symbol associated with them, so slowly these became the symbols of the planets. The first example we have of this is Roman where the gods are shown with their symbols. Jupiter has his staff (although sometimes he has a lightning bolt); Saturn his scythe; Mars his spear; Mercury his caduceus; The moon has a lunar crown and the sun has his rayed halo. Venus has a necklace from which a ring is hung. Here is what the symbols would have looked like if they were used in a modern astrological way. It is possible to see where our modern symbols came from, in some cases and it does rather poor cold water of some of the speculations of later eras. If we think for example about the importance of placing the planetary symbols on the cabbalistic Tree of Life, or how all the planetary symbols are actually born from one single symbol we discover how far off the mark some of the occult teaching has been. That is not saying it is bad, or even wrong, it is just that they have missed the point of what the symbols were supposed to mean. Very intriguing, the High Rennaissance, or the late 1400’s, Italy most of all, brought so much renewed insisght and new techniques to the science and art of astrology. Here is just one more example. True but in this case they were also castrating the planets from their pagan associations.